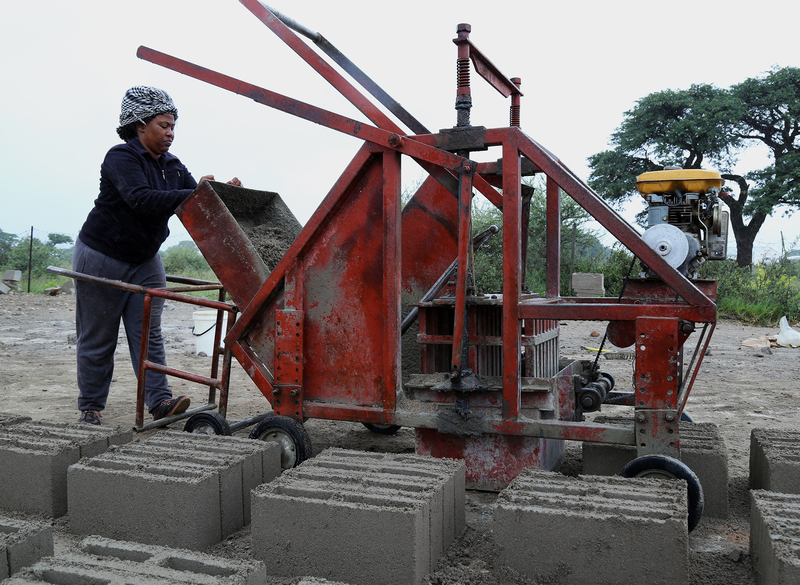 After completing her studies, Tsholefelo Ntlhabang struggled to find formal employment as a brick layer and plasterer in the construction industry. 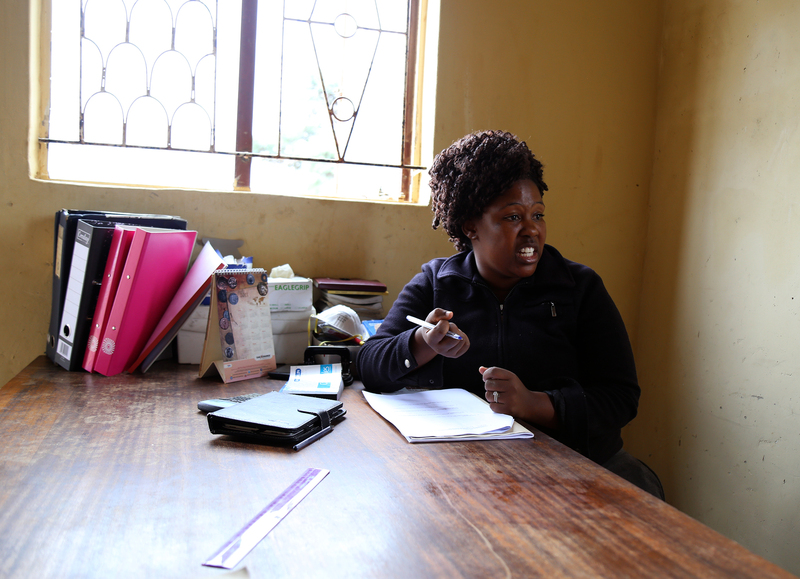 After several piece jobs, she mustered up the courage to approach Youth Development Fund through the Ministry of Youth Sports and Culture (MYSC) and CEDA to assist her is starting and subsequently grow her business. 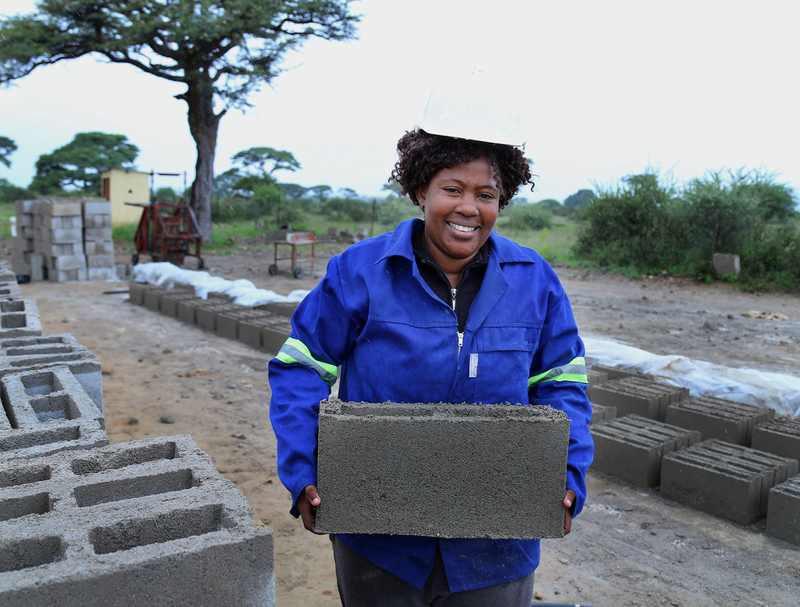 She started her business from humble beginnings and is now recognised as a top businesswoman supplying bricks to builders in Good Hope. 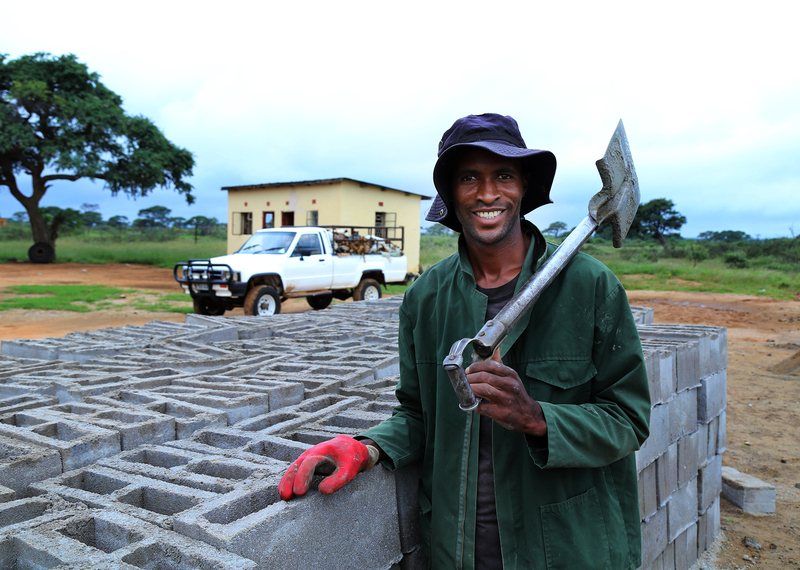 After completing my studies in Bricklaying and Plastering at Tswelelopele Brigade in Kanye I went looking for formal employment in the local construction companies. I really struggled to find permanent employment because most construction companies hire brick layers and plasterers on a short-term basis. 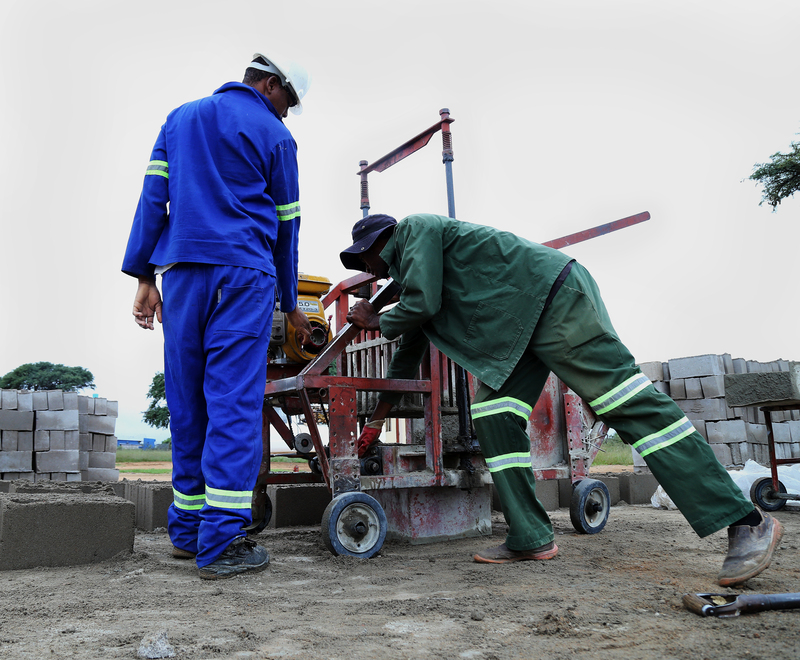 I was then fortunate enough to have found a small job as a sub-contractor in Debswana Mine in Jwaneng to build a small workshop, after completing that project I decided to take matters into my own hands and become my own boss. I decided to look into the business of brick moulding and start my company. It took me approximately 3 months to investigate my options of where I could possibly seek finance to start up. It was then when I made the conscious decision to find a plot where I could open up a brick yard and start brick moulding. I first approached the Ministry of Youth, Sports and Culture to try and seek funding through the Youth Development Fund. I applied for the brick moulding business in Goodhope. After 3 months the Ministry of Youth called me to tell me that I was successful in my request for funding and would be funded for my project to the tune of close to P100 000.00. After receiving this amount, I immediately bought machinery and started my business. After recognising the potential and establishing myself as a one of the only suppliers of building bricks in Goodhope I saw the need to grow my business and ask for additional funding from other financial institutions. I approached several commercial banks and other Development Financiers but was unfortunately turned down as they did not feel my business was viable. This however did not deter me because I wanted to see my business grow and be recognised as the leading supplier of quality stock bricks and also meet the high demands of my customers. How did you approach CEDA to ask for funding? I had always known there were institutions such as CEDA, but had always thought it only assists large scale businesses and I would not meet their requirements. In 2013, whilst at the Consumer Fair at Gaborone Fairgrounds, I approached the CEDA stall and started asking questions regarding funding and subsequently expanding my business. The officers manning the stall on that day were very informative and sat me down to explain the loan financing process, and interest rates. They shed light on how I could source funding for expanding my project and also submit a business proposal and plan for approval. After that meeting I was referred to the CEDA Branch in Kanye. I sat with a Customer Advisor that gave me all the required documentation and showed me how to fill out the forms and what additional information I needed to bring for submission. I was also advised to seek assistance from the Local Enterprise Authority on how to compile my business plan. I believe that through their assistance the application process was made simpler and hence my success. Since being financed how has your relationship with CEDA been? When it comes to my relationship with CEDA I can honestly say that it has really been fruitful. As a financier, CEDA has really taken it upon themselves to help me in growing my business. From the onset CEDA has constantly been monitoring my progress and checking in on me. CEDA has also helped me with training. I have been to Procurement Training where I learnt the ins and outs of submitting tenders. I was fortunate enough to win 2 tenders from the Goodhope Primary Hospital. I have also come to form an honest and strong bond with my Portfolio Executive. I keep CEDA regularly updated on my challenges and successes. Through this relationship I am able to keep up with my loan repayments and also identify areas where I need to improve upon. What challenges do you face daily? The biggest challenge my company faces is the short supply of river sand and water that are used to make the bricks. Due to the water restrictions I spend more money buying water which adds up to my operational costs. It is also hard to find good labour. A lot of my employees do not last long. Usually after I pay them they do not come back which makes it difficult to find quality workers that are willing to stick with me for the long run. Another challenge is pricing of our products. There are no regulators in this industry so you can really get challenged by people who will sell their products at a significantly lower price. Even with these challenges I still consider myself a market leader and have broken many boundaries as a woman in a predominantly male oriented environment. As a woman I have really taken the time to understand that this business is based on 3 things which are; quality of my stock, maintaining relationships with customers and always being ready to deliver the stock as and when it is ready for delivery. As a businesswoman I need to ensure that my employees are also paid on time to ensure they are loyal to my business and their work. With regard to my customers I ensure I give them quality products and service coupled with good customer relations and regular check ins. I have learnt that without maintaining relationships with customers it will be difficult to get repeat buyers and those repeat buyers are good for business as they keep the cash flow going. I also ensure I deliver bricks on time and always keep enough stock to meet the demands of my clients. 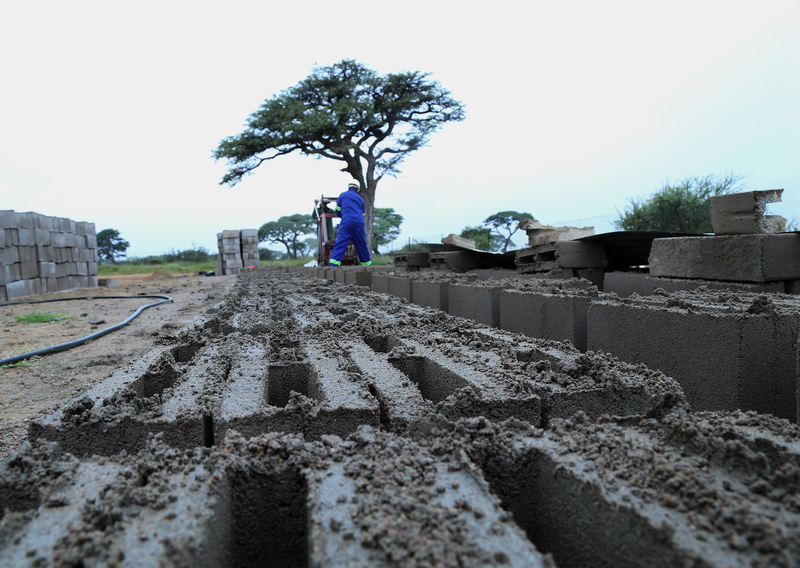 With good quality bricks and timely deliveries I know my business will grow in the future. In order to keep track of what goes out and what comes in I am good with record keeping and accounting. When I first started I started with four employees but to date I have only 3 employees. Some employees come and go because they simply say that the work is difficult and opt to leave for greener pastures. I am really passionate about this business and it is important for me to look for ways to grow it. I want to diversify and produce more products such as pillars, pavers, precast walls and curb stones. By expanding my product line I will be able to attract a wider range of clients by offering them more variety. Through these products they would not need to go anywhere else and rely on me to provide them with their products. I would like to advice all those wanting to get into business to really understand what they are getting themselves into. Young entrepreneurs need to understand their market and core business principles. They also need to be trained in things such as record-keeping, bookkeeping, customer relations, quality assurance and labour issues. With a firm knowledge of these elements they can really work productively and make their business successful. Entrepreneurs must also understand that the road to business success is not always smooth. There are times that you may want to give up because its gets tough. You cannot afford to give up because that is the nature of business. It has its ups and downs but one must be resilient and hold strong to ensure that they keep their eye on the prize.